If you're looking to learn about SAA you've come to the right spot - this is the most extensive store of information about South African Airways. Find the latest SAA (South African Airways) flight news here, and a detailed history of the airline. To get SAA flight specials and other airline news emailed to you, subscribe to our (free) flights mailing list. 28 August 2017: As our National airline requires yet another bail-out, they are finally considering some drastic changes. SAA will reduce flights on their most profitable route Cape Town - Johannesburg, and is rumoured to consider axing Cape Town flights to East London and Port Elizabeth. The airline is also considering letting go of flights to Middle-African countries like Milawi, Rwanda, Gabon and the Republic of Congo. This will allow SAA to scale back their fleet from 50 aircraft to only 40, of which they own nine. In response to this, Finance Minister Gigaba has reportedly suggested that government sell its 39,76% shares in Telkom, which are largely profitable, in order to fund the R10 billion bail-out of SAA. Government currently earns about R800 million in dividents per year and a hasty sale will largely cause them to sell at a price below its actual value. 12 May 2017: SAA finally has a new CFO appointed. Phumeza Nhantsi has been interim CFO since November 2015. She is a qualified chartered accountant with experience in the aviation industry, a suitable person for the position. The airline has also indicated that a CEO will be appointed shortly. We are also expected to get updates on the possible merging of SAA and SA Express. 15 March 2017: Winter storm Stella caused some disruptions yesterday as it beat the US East Coast with tonnes of snow and icy conditions. Among other airlines, SAA had to cancel their flights to Washington and JFK. The storm and knock-on delays might still result in flights for today being cancelled. The airline has advised for passengers to check their flight status before departure. 16 February 2017: Over the years Comair has laid many complaints of anti-competitive behaviour against SAA and Mango, the first of which was decided in their favour yesterday. During the period of 1999 until 2005, SAA offered travel agents incentives that other airline's couldn't match. Comair CEO Erik Venter said that SAA has abused their position as the dominant in South Africa to the detriment of other airlines and passengers. SAA has subsequently been ordered to pay upward of R1.16bn, which they will take under advisement of their legal team. 9 December 2016: SAA has taken delivery of the first of their A330-300's earlier this month. The first two aircraft will be used on the Cape Town - Johannesburg route where demand justifies it, but generally it will be used on both domestic, regional and international routes. The airline will take delivery of the remaining three A330's later this month and early next year. 2 December 2016: SAA's new pet lounge opened on the 1st of October at OR Tambo and aims to provide travelling pets a calm environment to relax in before the journey which can often be distressing. Besides comfort, the lounge is also focused on the safety of your fur babies. The SAA Pet Lounge can be booked through the airline's reservation centre or through pet shipping agents. 15 September 2016: Finance Minister Pravin Gordhan recently awarded SAA a R4 billion bailout which allowed the technically insolvent airline to release their financial statements. Gordhan didn't hand over the money freely, requiring the airline to ruthlessly axe loss-making routes (potentially PE and East London) and to appoint a permanent CEO and CFO. They will also reconsider the merging of SAA and SA Express. 12 September 2016: For a limited period, SAA passengers travelling through OR Tambo International will be able to tag their own bags. This is only applicable to domestic travellers with a three-digit flight number. Passengers must be in posession of valid identification and a boarding pass. Passengers will first print the valid number of tags before weighing their bags. SAA staff will be on hand to assist at the relevant counters (47-50 in Terminal B). The trial period will end the 30th of November 2016. 7 July 2016: SAA once again finds itself in hot water, as it is revealed that they ignored procedure in a R14.6 billion contract. The airline apparantly awarded a contract to restructure debt to a small debt company without putting out a tender for it and against the advice of its own treasury. This follows scandals in December last year when President Zuma's firing of Nene was reportedly related to SAA's financial woes. 25 May 2016: SAA are increasing their flights to Mauritius from Johannesburg to eleven per week. The additional flight will mean that there is now a double-daily service on Wednesdays as well as Thursdays, Saturdays and Sundays. Menon Ramasawmy, SAA manager for Mauritius and Indian Ocean Islands, said: "We have experienced significant growth in South Africans wanting to travel to Mauritius. For the period January 2015 to December 2015, the number of South Africans travelling to Mauritius grew by 9.5%, passing the threshold of 100,000 passengers a year.” This is in line with their ong-Term Turnaround Strategy. 10 May 2016: President Jacob Zuma confirmed last week that SAA is not for sale. The President said in no uncertain terms that SAA will be able to secure future goverment guarantees should it need to, saying: "We are going to work hard to ensure that we support SAA so that it can take off and reach the destinations that ... we want to reach." The hope that SAA will soon be able to stand on their own two feet seems to be very far off as Myeni said that SAA should be able to function without government guarantees in the next few years. Chairperson Myeni has been rumoured to have a romantic relationship with the president, which might explain why he'd choose to ignore the blatant missmanagement of our national carrier. 23 March 2016: Following a brief testing period on Mauritius flights last year, SAA will be replacing newspapers with Samsung tablets on selected short haul regional flights for business class travellers. 500 Samsung tablets will be pre-loaded with South African, African and international content that can be used to read magazines, watch movies, listen to music and play games. They are currently looking at extending this offer on their Nairobi, Kenya route. 22 March 2016: Douala International Airport in Cameroon has resumed operations on the 21st of March 2016, following work done on the runway. SAA has also resumed its scheduled flights to the airport. 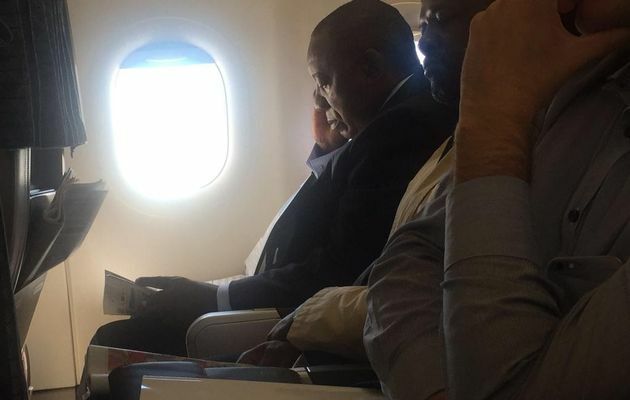 3 March 2016: Deputy President Cyril Ramaphosa flew SAA Economy class between Cape Town and Johannesburg yesterday, in stark contrast to the extravagant and problematic presidential jet. According to reports, this is not the first time that the deputy president has made use of commercial flights. His spokeperson Ronnie Mamoepa said that the Deputy President has always chosen commercial flights and has previously flown with commercial airlines to Sweden‚ Mexico and South Sudan. No news on whether he made the almost 24 hour journey in cattle class (guessing not) but it appears he is indeed a window-man having chosen a seat next to the window. Finance Minister Pravin Gordhan also favours commercial flights, specifically in economy but he is usually seated next to the aisle. These are clear moves to display government austerity as well as support for state-owned enterprises, but as President Zuma is waiting on his R5 billion jet the efforts aren't enough. 24 February 2016: All eyes were on Pravin Gordhan today to hear what the future holds for SAA and other state owned enterprises. Suggesting a merger between SAA and SA Express, Gordhan said that the government has no need for four airlines and that Public Enterprises Minister Lynne Brown has agreed to explore the option of a merger as well as gaining a minority partner. He said all this should be done under a strengthened board. Treasury said: “In the period ahead, government will seek opportunities to enter into strategic partnerships that allow SAA to draw on private-sector capital and technical expertise to improve its performance and expand its network.” For all those who feared that the airline's demise is imminent, the government has news for you. Instead of cutting their losses, they will continue to try and revive the airline by taking drastic action. “Government remains committed to stabilising SAA. As part of a broader turnaround strategy, steps have been taken to reduce aircraft leasing costs, cease operations on some unprofitable routes and achieve procurement savings.” The question remains, have they waited too long? And more importantly, will it be enough to turn the airline in the right direction? 19 February 2016: In a surprise move, SAA announced yesterday that they have discontinued their partnership with Etihad. This follows after SAA scrapped their Abu Dhabi flights last month. “We are confident that most routes previously served through this code share can be accommodated through SAA’s other code share partners and within the Star Alliance,” SAA acting ceo Musa Zwane was quoted as saying. The question has to be asked, that if that was the case why they signed the code share in the first place. 29 January 2016: SAA has allegedly cancelled their direct flights to Abu Dhabi. This follows the reduction of flights on the route in November last year. Travel agents noted that they can no longer book SAA flights from Johannesburg to Abu Dhabi. Whilst SAA has not yet confirmed the cancellation, Etihad has confirmed that all passengers booked on the SAA flights to Abu Dhabi would be accommodated on Etihad flights at no extra cost. There have been talks of a possible direct route from Cape Town to Abu Dhabi, but it is doubtful whether SAA would opt to operate flights from Cape Town as they are trying to establish their base in Johannesburg. All Gold Members of the Star Alliance will receive a free upgrade on the Heathrow Express. You simply have to buy a regular full fare or return fare on the Heathrow Express and board the Business First Class carriage, ensuring you have both your ticket and Star Alliance Gold card to show the attendant. SAA expects to have nine A320s operating all flights into Africa and on domestic routes by the end of August 2014. In the first quarter of 2014 SAA took delivery of a further 4 A320s, in addition to the 2 received last year. They expect to receive another A320 in Jun 2014, 2 in the 3rd quarter of 2014 and one more in the fourth quarter of 2014; bringing to a total of 10 A320s delivered by the end of 2014. 23 July 2013. SAA takes delivery of its first 2 of 20 Airbus A320s it ordered in 2010, which have 114 passenger economy class and 24 pax business class. The aim is to use them to replace their B737-800s and augment its Airbus A319s. The CEO of South African Airways, Monwabisi Kalawe said that “We are delighted to receive our first two A320 aircraft. Operating a modern and homogenous fleet plays a significant role in cost reduction and boosting revenue. The A320 will assist SAA to achieve this while providing our passengers with a more superior cabin product." 14 May 2013. Malusi Gigaba, the Minister of Public Enterprises, announces that South African Airways will start receiving its 20 new A320 Airbuses "in the next quarter", which it is purchasing to improve the fuel efficiency of the long haul fleet. Mar 2002 : SAA CEO Andre Viljoen announces that a $3.5 billion fleet renewal contract has been awarded to Airbus, including orders for 15 Airbus A320, 11 A329s, 9 Airbus A340-600s and 6 A340-300s. SAA had been longtime Boeing customers. This followed test flights on Airbus and Boeing aircraft, in which practically the entire board took part. SAA decided that Airbus should fly first, and Airbus plied their guests with sales chat and champagne in a 4-engined A340 - their sales message was that "four engines are better than two", and emphasised that this was especially true in hot, high airports like Johannesburg where engines need to work harder. Boeing countered that 4 engines were twice the trouble, and when the A340 landed, Boeing's Toby Bright transfer the SAA board onto his B777. As the 777 roared down JNB's runway, though, 1 of its 2 Rolls Royce Trent 800 engines seized up with a bang and take-off had to be aborted. "We had to screech to a stop on the runway, taxi back and park beside the A340 and John Leahy was standing there. It was the worst experience of my sales life. As soon as I saw the engine had blown I knew we had lost." said Bright. Airbus won the SAA contract but the Boeing 777 has gone on to outsell the Airbus 340 six to 1. 2000 : In order to phase out the A320s & A300s on domestic flights, an order is placed for 21 B737-800NG planes, with 5 of the jets ordered direct from Boeing. The cost for the new jets was reportedly USD680m. 1 Feb 1955 : SAA's fleet now consists of 25 aircraft. Africa : Air Mauritius, Air Seychelles, Airlink, Mango Airlines and SA Express for domestic flights. January 2015 : From the 29th of March 2015 SAA will operate daily Etihad flights from Johannesburg to Abu Dhabi. This means more flights between the two cities and better connections from Etihad's hub to their wide network of destinations. Etihad will also place its EY code on 16 other SAA flights from Johannesburg to other African hubs. In exchange SAA will place their code on 32 flights from Abu Dhabi, thus expanding their network. This also benefits both SAA's Voyager and Etihad's Guest frequent flyer programs. We are glad to see the relationship between the airlines flourishing. Hopefully it will benefit both parties equally! March 2014 : When 2 competing companies want to collaborate, even if they are not both based in South Africa, they need to apply for exemption from the Competition Commission. SAA & Etihad want to work together but they are competitors, and so have submitted a joint application to the South African Competition Commission "to be exempted from certain provisions of Chapter 2 of the Act", for a minimum of 5 years. Etihad & South African Airways want to enter into a codeshare on the Johannesburg to Abu Dhabi flight route; whereby both airlines are flying the route, and each airline is selling the other's flights on the route on its booking systems. There will also be onward flights from Johannesburg & Abu Dhabi involved in the deal. From Abu Dhabi to Athens, Bangkok, Beirut, Colombo, Dublin, Ho Chi Minh City, Jeddah, Ad Dammam, Karachi, Kuala Lumpur, Kuwait City, Manama, Manchester, Manila, Milan, Muscat, Seoul, Riyadh, Shanghai and The Republic of Singapore. From Johannesburg to Accra, Brazzaville, Buenos Aires, Cape Town, Cotonou, Dakar, Durban, Harare, East London, Livingstone, Lusaka, Ndola, Pointe-Noire, Port Elizabeth, Victoria Falls and Windhoek. The 2 airlines plan on coordinating schedules, collaborating on flight prices, joining marketing efforts including joint sales to travel agents. 21 Feb 2014 : Qantas end their codeshare with South African Airways. SAA has applied for more flight frequencies to Accra, Blantyre and Lagos. The new route applications are to Abuja, Asuncion, Cape Verde, Ilha do Sol, Jakarta, Kingston, Lome, Malabo, Montevideo, Moscow, Ndjamena, Ouagadougou, Port of Spain and Praia. Exciting times for the national carrier. SAA says it is required to hold the rights to even operate on a codeshare basis, so has applied for them. 6 Feb 2014 : A codeshare with Virgin Australia has been announced, which is a little bit awkward...because South African Airways is also codesharing with Virgin Australia competitor Qantas. On the SAA website you will now be able to book onward flights from Perth to Adelaide, Brisbane and Melbourne (but not Sydney, to avoid taking business from Qantas, who fly from Johannesburg to Sydney). 29 January 2014 : South African Airways has increased its codeshare agreement with Air Seychelles to include 6 Air Seychelles hops from Mahe to Praslin Island. 20 December 2013 :SAA's codeshare with Mango Airlines has been extended to include Mango flights from JNB to CPT, DUR & PLZ, as well as CPT to BFN. This is in addition to the existing codeshare on Mango Lanseria to Cape Town and Cape Town to Durban flights. 16 December 2013 : South African Airways and Jet Blue enter into a codeshare arrangement, whereby JetBlue is selling SAA operated flights from New York and Washington to Johannesburg, and onwards to Cape Town, Durban, Port Elizabeth and East London. "We're very proud to be one of JetBlue's first bi-lateral codeshare partners. Our successful partnership over the past three years has made it clear that a bilateral agreement would be the next natural step, particularly between two airlines that offer such extensive service in their respective markets. We have been introducing customers throughout Africa to JetBlue's outstanding service, and we now look forward to welcoming JetBlue's customers on board and offering them our award-winning service and exceptional destination and vacation options." said Marc Cavaliere, Executive VP of South African Airways, North America." 6 November 2013 : Air Seychelles and SAA have expanded their codeshare agreement, to cover PE, East London Durban, Cape Town and Praslin Island. So, you'll be able to book Air Seychelles flights to Praslin via the South African Airways website. 31 July 2013 :SAA currently flies into the US on a daily basis from Dakar to Washington & from Johannesburg to New York. It then sells onward flights into the US to places like Chicago, LA and Orlando through a codeshare with JetBlue. JetBlue and South African Airways are planning on extending their existing codeshare agreement, so that JetBlue sells SAA's flights from Washington to Dakar (daily, every afternoon), New York to Johannesburg (which leaves each morning), and onward flights from Johannesburg to Cape Town, Durban, Port Elizabeth & East London. The agreement still needs approval from SA & US regulatory authorities. South African Airways VP North America, Marc Cavaliere, said that "South African Airways' partnership with JetBlue has been a successful one from the start, and so we're pleased that it has now grown into a bilateral codeshare arrangement, providing our customers with even more convenient booking and travel options, Our customers have raved about the ease of travel on both airlines. It was only fitting that we expand the partnership and introduce the JetBlue code onto SAA flights and into the African continent." VP of JetBlue, Scott Laurence, said that "We are excited to expand our successful relationship with South African Airways through this new codeshare via Washington and JFK, where JetBlue is the number one domestic airline. South African has been a terrific travel partner for JetBlue, consistently delivering a great experience for our customers. We look forward to working with them to offer even more travel options in the years to come." 1 July 2013 : SAA starts offering Etihad flights from Johannesburg to Abu Dhabi, Abu Dhabi to Bahrain and Abu Dhabi to Kuwait City. This is the implementation of the codeshare announced on the 6th May. Presumably there'll be more announcements to come, as SAA said it would be offering 12 onward flights from Abu Dhabi, as here are only 2 (Kuwait and Bahrain). December 2013 : SAA adds Air New Zealand's Perth to Christchuch flights on as a codeshare, meaning you can fly 1-stop from Johannesburg to Christchurch via Perth. 6 May 2013 : South African Airways & Etihad agree a codeshare agreement. Inter alia, SAA will be offering 12 onward flights from Abu Dhabi. “This extensive commercial agreement will enable SAA to access the vast majority of Etihad Airways global markets. We are pleased to build upon the commercial areas of the agreement which are fundamental to a modern airline partnership.” said Nico Bezuidenhout, acting Chief Executive of South African Airways. 25 Apr 2013 : Air Seychelles and South African Airways enter a codeshare agreement. The initial step is that SAA will sell Air Seychelles flights between Johannesburg & the Seychelles on its website. "This partnership signals a strategic move by both airlines to increase connectivity and grow their networks. This also augments SAA's already extensive African footprint. SAA currently flies directly to 26 destinations across Africa from its Johannesburg hub. Furthermore, the partnership adds breadth to our network, incorporating two additional destinations to the existing global partnership network which provides in excess of 1329 destinations in 194 countries globally. With strategic partnerships such as this one SAA is able to provide its passengers with more connections on the continent and across the globe." said SAA General Manager Commercial, Mr M Papa. 16 Apr 2013 : Jet Airways and South African Airways sign a codeshare agreement allowing you to book 1-stop flights from JNB to Bangalore, JNB to Chennai, JNB to Delhi, JNB to Hyderabad and JNB to Trivandrum (all via Mumbai, where the JNB to Mumbai leg is with SAA, and the 2nd leg of the trip is with Jet Airways). 31 Mar 2013 : SAA are selling Scandinavian Airlines (SK) flights from Frankfurt to Stockholm & Frankfurt to Oslo. 1 Mar 2013 : South African Airways has introduced codeshare arrangements with Virgin Atlantic for flights to London, Manchester (from 31 March 2013), Edinburgh (5 April 2013) & Aberdeen (9 April 2013). 15 Jun 2009 : SAA & Air India enter into a codeshare agreement. 1 Jan 2009 : On 24 Dec 2008 TAP Portugal and South African Airways sign a codeshare agreement for the Johannesburg - Lisbon flight route, and also includes flights to Port Elizabeth, Durban, Cape Town, East London, Porto, Funchal and Faro. Subject to government approval, the agreement will take effect from January 2009. 26 Oct 2008 : SAA expands its codeshare with All Nippon Airways to include flights from Hong Kong to Narita Airport, Tokyo, Central Japan. Mar 2007 : SAA enters into a codeshare agreement with All Nippon Airways, for flights between Hong Kong and Osaka (SAA operates flights between Johannesburg and Hong Kong). 26 May 2016: SAA has been granted further extention to table their 2014/2015 financials and a new deadline has been set at 15 July 2016. This is the third extension for documents that were already due last year September. The reason SAA can't submit these documents is because they are technically insolvent, but can't ask for government guarantees before a new board of directors has been appointed. There is also no further news about the proposed merger. 15 January 2016: New Minister of Finance, Mr Pravin Gordhan, stated yesterday that he will not let SAA crash. Does that mean that another government bailout is imminent? Perhaps not! "SAA must not be a liability to the fiscus. Ideally, in as short a time as possible, it must learn to stand on its own two feet. They must pay dividends to the state instead of asking for bailouts," suggesting that Gordhan might recommend a different course for cash strapped SAA. Selling off the profitable Mango airlines has been suggested as an alternative income. Gordhan has also mentioned that proper leadership is needed. 12 January 2016: Today marks the closest the ailing airline has been to insolvency thus far. Following the release of an internal memo which states that the airline is technically insolvent on the 18th of December 2015, Citibank cancelled the airline's loan facilities. Government has been aware of the cancellation since it happened in December, but have kept it under wraps for as long as possible. The only way that the airline can continue operating is by acquiring further funding from another bank with a state guarantee or through a state loan. Either way, SAA's situation is dire with little hope of the airline making the necessary changes. February 2015 : Things were looking bleak for our National carrier as they are technically bankrupt and the government announced mere months ago that they won't be handing out any more cash. As things stood, SAA would not have been able to release its financial statements. But things are looking up. Following the recent update on the 90 Day Action Plan the latest state guarantee of R6,488 billion will give the airline new hope, but to what end? This guarantee does come with some conditions. SAA has to provide comprehensive details of its 90 Day Action Plan and the strategy will have to be stress tested. They also have three months to present a new structure, fleet strategy and plans to reduce costs, while improving governance. Let's hope it is not more Tax-payers' money down the drain. 30 October 2014 : SAA CEO Monwabisi Kalwe under strict guidance from the new minister of public enterprises Lynne Brown is working on the airline’s 9th turnaround plan in 13 years. Kalawe has looked outside of the company for help, employing change specialists to try and turn the crippling, debt ridden airline around. The new plan will however cost the airline more money that they don’t have and according to the latest Fin Weekly, the minister wants the plan to be “implemented yesterday”. Kalawe must be very eager to get the plan up and running because the minister has already personally overseen the resignation of 6 board members in this month alone. Dudu Myeni, the chairwoman of SAA has been kept on despite being heavily criticised by the board for her weak performance and they even called for her to be removed from her post. Kalawe, Myeni, CFO Wolf Meyer and non-exec Yakhe Kwinana are those who have been kept in SAA to get the newest turnaround plan called Operation Gaining Altitude up and running. John Tambi and Anthony Dixon are the new additions to the team. Tambi’s expertise lie in project management and engineering while Dixon has 29 years of experience in auditing. Both SAA and its subsidiary, SA Express, are technically insolvent. The taxpayer has been bailing both the airlines out for a number of years. SAA and SA Express has failed to produce their financials on time for the third year in a row despite being given R5bn and R539million last year from the government. Lynn Browne has hinted at privatising a percentage of SAA as a way of raising money to keep the airline afloat. The success of state owned arms manufacturer Denel, 51% of which has been sold off to German industrial group Rheinmetall in 2012, has been used as an example of what could be possible if SAA decides to sell a stake in the airline. One of the major problems at SAA is its bloated workforce. Former minister of public enterprises (now minister of home affairs) Malusi Gigaba defended his decision not to lay off staff when he was the minister. He said that the airline has to provide jobs to the people of South Africa no matter the cost. However the new Minister of Finance Mr Nhlanhla Nene has a different view all together. He has called for public sector spending to be cut and his focus has been squarely set on the workforce at SAA. Many socialist business analysts have been criticising the minister’s plan of privatising a percentage of SAA because they believe that it would lead to a massive loss in jobs as the company would only focus on the bottom line rather than the society as a whole. According to some, capitalism has done little to help stem the tide of poverty in South Africa. It seems like the airline is walking a tightrope. On the one side they have social responsibility and on the other they have economic prosperity and a chance of making profits. We will have to wait and see which side they are going to fall on. 2 October 2014 : It has emerged this week that SAA will once again be seeking a government bailout. This comes after the state owned airline was granted R5bn by the government through loan guarantees only two years ago. The request came to light after SAA failed to submit their annual financial report to parliament before the Tuesday (30 September) deadline, there has been no mention of an exact number by SAA. The minister responsible for looking after SAA for the last 5 years was former Public Works Minister Malusi Gigaba. He was promoted earlier in the year to minister of Home Affairs. Yes that’s right the guy who seemingly helped SAA lose R5bn over the last 2 years is now responsible for the new visa regulations that have been giving people in the tourism industry a headache over the last couple of months. We can only guess what his next move will be but if history is anything to go by, we shouldn’t be too excited. 8 August 2014 : South African Airways will, according to the government, require around R50 Billion from private investors to stay afloat. The unprofitable state-owned airline is still trying to renew its fleet despite the huge losses that the airline is reporting year in and year out. As of March 2013 the airline has accumulated a staggering total loss of around R16 Billion. Public Enterprises Minister Lynne Brown said that they are looking for private investment in the form of loans or bonds that will be backed up by the South African treasury. The airline is looking to replace their older models on their long haul routes with new fuel efficient aircraft which will bring down their operating costs. The airline is said to only break even in 2016 or 2017. Their debt will however still be there and with another 3 years to go before they are set to break even the R16 Billion total loss will surely grow. The airline is blaming their losses mostly on their old fleet and the high cost of keeping these old planes going. It is however hard to believe that only fuel efficiency is to blame for these huge losses. Management should be held accountable, but then again management is government in this state owned airline. Our taxpayer money is being used to keep this airline afloat, who is going to hold the government accountable? 26 Feb 2014 : Losses on all SAA intercontinental Routes - The airline has begun rolling out more fuel efficient airlines, and culling loss-making routes. This is presumably where it expects to make the R300m savings announced to Parliament. "I feel a bit more comfortable and believe that the SAA are on the right track. But still there is a lot of expenses. We haven't really got clarified in this meeting today, and that is what worried me." said Herman Groenewald, MP for the Democratic Alliance. The airline reported a R990m loss in its last financial year. But all international flight routes are making losses, from R60m to R309m on the JNB to Beijing route. CEO, Monwabisi Kalawe, told parliament that SAA are flying loss-making destinations "in support of the country's trade agendas". 29 Jan 2014 : SAA reports a R990m loss in its financial year from 2012 to 2013, with headcount/salary costs ballooning as well as fuel costs (as a result of the Rand weakening). Revenue increased by 14%. One issue which hasn't been addressed is why they have taken so long to report their financials. SAA's year end was 31 March 2013, and it is now 10 months later. If they were a listed company they would be in deep trouble - a company listed on the JSE has to distribute financials within 3 months of year-end. Ideally, public enterprises should be setting the standard for transparency and timeliness of financial reporting. SA Airways wants to get a west African hub going, perhaps in Nigeria, as OR Tambo is too far south to act as a good hub for African flights. SAA takes out a bank loan for R1.5bn, underpinned by a government guarantee. 2 Oct 2012 : The South African Government has granted South African Airways' request for a R5bn guarantee. Here's a joint statement issued by National Treasury & the Ministry of Public Enterprises: "The South African Government has granted South African Airways a R5 billion guarantee for a period of two years starting from 1 September 2012. The guarantee will enable SAA to borrow from the financial markets, thus ensuring that the airline continues to operate as a going concern. The guarantee requires that the SAA Board develop a turnaround strategy to be approved by the Minister of Public Enterprises in concurrence with the Minister of Finance. This will include SAA providing the DPE and Minister of Finance with the financing strategy for its planned purchase of short and long haul fleet. Furthermore, a technical committee comprising representatives from the National Treasury and DPE will monitor SAA's financial position, and progress with developing and implementing the turn-around strategy. Government is committed to working with SAA's management and board of directors to ensure that SAA is a viable and a financially sustainable airline." 15 Oct 2012 : Post-AGM speech by Malusi Gigaba, the Minister of Public Enterprises, in which he looks inter alia at the interconnection between SAA & travel, noting how other sectors depend on air transport. The Minister is particularly concerned about how the airline's liquidity position has deteriorated over the last 2 years. The Minister also brought attention to how voyager income and maintenance reserves had been restated, and and stipulated that any future changes in accounting policies and revaluation of assets would require his approval before implementation. The Minister has instructed a task team to "draft & implement a long-term turnaround strategy" - the task team consists of the Acting Director General in the Department of Public Enterprises, SAA's Chairperson, Mango Airline's Chief Executive and the Chief Executive of South African Express (this team must report to the Minister by 15 December 2012). Executive Directors' remuneration are to be increased by 0%. Mar 2004 : In its financial statements to the end of March 2004, Transnet reported that it had recapitalised SAA by R6.1bn near the end of its financial year (which ended on 31 March 2004), as a result of an a fair value adjustment (2004 - R4,5 billion, 2003 – R5,3 billion) to the SAA hedge book over the previous two years. SAA had purchased currency forwards that fixed the rate at which it would exchange rands for dollars at R10.85 for a US Dollar. However, the rand strenthened against the US dollar meaning that South African Airways was paying more than market rates for its US dollars. SAA used the Transnet recapitalisation monies to closed the hedge book at a total cost of R6.0 billion by 30 June 2004. SAA suffered a net loss of R8.7bn in the year to 31 March 2004. Feb 2000 : Coleman Andrews states that South African Airways is valued at R8.5 billion. 19 November 2015: Instead of finally appointing a permanent CEO that can steer the ailing airline into a definitive direction, SAA has once again opted to appoint another acting CEO. Thuli Mpshe, previous acting CEO, has been moved back to her previous department to deal with the pilots who recently voted that they have zero confidence in the airline's board. To further the airline's woes they are requesting a further R4bn-R5bn to balance the sheets. They claim that heritage deals are still costing them, but government is once again playing the cold shoulder stating that they won't fund the airline any further. 18 November 2015: SAA will no longer operate daily flights between Johannesburg and Abu Dhabi, reducing the service to four days a week. SAA spokesperson Tlali Tlali stated that the route performed below expectations with their parnership with Etihad having no effect on the demand. Etihad will now operate the cancelled flights so that there is still a double daily service. 2 November 2015: The direct flights between Johannesburg and Beijing have finally taken off! Air China completed their first flight according to the agreement between the two airlines on the 30th of October 2015. Air China had originally planned to start operating on this route from May this year, but had postponed citing multiple reasons. 14 October 2015: SAA has introduced a second flight to Nigeria in a bid to expand their West African presence. In addition to flights to flights to Lagos, they will also be offering flights to Abuja. SAA CEO, Sylvain Bosc said: "A second entry point in Nigeria forms part of our Long-Term Turnaround Strategy, which identified growth on the African continent as one of its key objectives. Nigeria is one of the fastest growing air travel markets in Sub-Saharan Africa and will be well served with our additional services to Abuja." The first flight will take off on the 26th of January 2015. 15 September 2015: SAA regional business class passengers will be able to enjoy the use of a Samsung tablet during their flight. The partnership between Samsung and SAA saw the first passengers enjoy the device on the 22nd of September 2015. Tablet devices offer a wide range of entertainment options like games, movies and music for the whole family. 26 August 2015: SAA has entered into a code share agreement with Jet Airways which will connect SAA's Johannesburg-Abu Dhabi flights from Abu Dhabi to five destinations in India. This will connect SAA passengers to Mumbai (BOM), Delhi (DEL), Bengaluru (BLR), Hyderabad (HYD) and Chennai (MAA). In return Jet Airways passengers travelling to Johannesburg will connect through SAA to Durban and Cape Town. 4 August 2015: Thuli Mpshe, previous GM of human resources, has replaced Nico Bezuidenhout as acting CEO of SAA. Whilst it is still unclear why Nico returned to Mango after what appeared to a be a succesful stint at our struggling National carrier, Tlali Tlali told us, “A decision has been taken to have Nico Bezuidenhout return to Mango where he will continue to serve as its ceo. We always understood his deployment at SAA was in an acting capacity.” We are not certain what qualifies Thuli to be the airline's CEO, but Tlali has stated that they will start the process of looking for a permanent CEO as soon as possible. Why they didn't start the process whilst Nico was the acting CEO isn't clear. 30 July 2015: Acting CEO for SAA, Nico Bezuidenhout, moved back to his position as CEO from Mango today, the 30th of July 2015. Nico has been acting CEO for SAA since November last year. His position at SAA was uncertain at the best of times, even after suspended CEO Kalawe quit. Although reasons for his sudden move back to Mango are unclear, one possible one is the completion of the short-term turnaround strategy. It is still unclear who SAA will employ in the permanent position but is worth noting that within the span of three years they've changed CEO no less than six times! We can't wait to see who they pull out of the hat. 8 June 2015: SAA and Virgin Atlantic are ending their codeshare agreement, which spanned more than 10 years, on the 26th of September this year. The main reason is that their networks no longer compliment each other, so it reached what Darrin Thomas from Virgin Atlantic called "a natural end." Passengers booked on codeshare flights after this date will be reaccommodated on the SA flight. 1 June 2015: It feels like only yesterday that SAA emerged triumphant from the North Gauteng High Court after Comair sought to have the Government bailouts declared unconstitutional, and already they are hitting back at Comair. SAA complained to the Competition Comission that Comair is engaging in anti-competitive behaviour. Citing the recent court application along with previous applications by Comair to stop FlySafair in 2013 when they did not meet all the aviation requirements. "The complaint relates to past and ongoing abuse of dominance conduct by Comair which is in contravention of various provisions of the Competition Act," said SAA spokesperson Tlali Tlali. “Comair’s past conduct indicates that its interests lie in the elimination of competition." Many might see this as rich coming from SAA, who are also taking Comair on with regards to agent commissions payable. In 2006 Comair won a complaint to the Competition Commission in which SAA received a slap on the hand with regards to the travel agents incentives they pay out. No other airline would have been abe able to match it and still turn a profit, yet SAA was able to do so with the support of the government and ultimately taxpayers' money. SAA reached a settlement agreement with the commission which they are now trying to prove is applicable to Comair's opperations as well. Comair's Erik Venter said that he will leave it to the Competition Commission to resolve, but he is sure that the allegations don't hold any merit. Erik added that the complaint is probably a desperate tactical move by SAA, which has a long history of anti-competitive behaviour. We can't wait to see how this will play out. 27 May 2015: SAA is strengthening their position in West-Africa by providing the first direct link between Ghana and the USA. From the 2nd of August 2015 SAA will fly non-stop between Accra, Ghana and Washington DC, USA. This considerably reduces travelling time for Ghanaians who had to previously travel via Europe. The four weekly flights will be operated by A340-600s featuring flat-beds in Business class. SAA has also entered into a bil-lateral codeshare agreement with Africa World Airlines, enabling them to offer seamless connections to the rest of Ghana. 18 May 2015: The Department of Trade and Industry and South African Airways (SAA) signed a memorandum of understanding (MoU). The MoU will give black owned companies exclusive access to a minimum of 50% of SAA’s yearly total spend of R20bn. SAA chairperson Dudu Myeni and Deputy Minister of Trade and Industry Mzwandile Masina signed the agreement on the 18th of May 2015. "We are committing ourselves to working with SAA and other stakeholders, including business, to make sure that of the R20bn that SAA is spending on procuring goods and services, at least R10bn should go to black business,” said Masina. Xolani Qubeka, secretary general of the Black Business Council said that the news of the signing of the MoU is like music to the ears of black business owners. Masina said that this is not a patronage scheme and black business owners need to deliver a service and product that is at a world class level. 24 April 2015: CEO Monwabisi Kalawe has resigned following his suspension in October 2014, thus rendering further disciplinary hearings unnecessary. The parties have supposedly agreed to this in order to save on legal costs. Mr Kalawe will receive his three months payment in accordance with the three months notice period as well as outstanding leave. This allows Mr Kalawe to leave with a clean record so that his carreer suffers minimally despite the fact that he was accused of sexual harassment. Meanwhile the future of Mango's CEO Nico Bezuidenhout who has been acting CEO since October last year is now uncertain. He has achieved what he set out to do, leaving SAA to move on with their long-term turnaround programme. Whether he has done enough is still to be seen. It is not sure whether his position will become permanent, whether he will continue acting as acting CEO or whether they already have someone else lined up for the position. I guess we will have to wait and see. 8 April 2015: SAA is introducing a new programme called "Step-Up" which will allow economy class passengers to bid on business class upgrades when available. Around 7 days before a flight's scheduled departure all the business class passengers will receive an email which redirects to the upgrades website. The website will calculate a minimum and maximum bidding fee depending on the original ticket price. Bidding closes 72 hours before the flight's scheduled departure time and upgrades will only be confirmed 24 hours prior to departure. Only successful upgrades will be charged on credit cards and unsuccessful upgrades won't affect economy class bookings. 21 April 2015: Late last week we started receiving reports from clients about R850 business class tickets from Johannesburg to Abu Dhabi. This was hard to believe and even more difficult to confirm as by the time we checked the fares had already been corrected. At the time there was no official report from SAA, but we now have proof in the form of a screenshot of the glitch. This screenshot proves that outbound flights from Johannesburg started at R595 and return flights from as little as R254. Even the more expensive options on this search is far below the average business class fare of about R35 000. It has been reported that SAA sold over 600 of these ridiculously prices tickets. It seems like we guessed correctly that this wan't going to be honoured as clients that booked these fares were reportedly contacted by SAA yesterday to be informed that the bookings won't be honoured. This despite the fact that everything had been confirmed and they were in possesion of their e-tickets. SAA has said that they will refund everyone but clients who have already booked accommodation might still be left out of pocket. Some have raised questions as to whether this is the latest publicity stunt from airlines as several international airlines have had similar issues of late. Etihad had a similar glitch last year with cheap flights from Johannesburg to New York but they were one of the few airlines who decided to honour the tickets bought at the rediculous fares. If any publicity is good publicity, it might explain the recent surge in online 'glitches' although the opposite is just as likely. 9 March 2015: SAA’s 90-day action plan was implemented last year with the intention to bring the struggling airline back on track towards reaching the milestones of its long-term turnaround strategy. SAA spokesperson Tlali Tlali has said that SAA has had to examine every aspect of the business to get it back to financial stability by using the guidelines set out by the 90 Day Action Plan. The airline has already recoded substantial savings after implementing the 90 Day Action Plan. But Tlali said that further changes still needed to be made and the unsustainable growth in SAA’s staff headcount over the last few years has impaired the financial stability of the business. Tlali refused to say how many jobs they are planning to cut. The company's latest annual report, which was publishes in 2013, states that the airline employed 11,462 people. 16 February 2015: SAA are now 60 days into their 90 day turnaround strategy and are making good progress. They have stated that in the remaining 30 days they will focus on strengthening governance and adding more valuable routes which might see more connections to Mauritius and Southern Africa. They will also focus on SAA's public image and try to improve what they can. In the meanwhile SAA are turning their attention to the long-term turnaround strategy which they say hasn't kept up with the times and requires some tweaking. Fuel prices has dropped tremendously and the Rand has weakened by nearly 40% since the strategy was put into place in 2013. 4 February 2015: From 1 April 2015 SAA will route all their Indian flights through Abu Dhabi. Whilst they won't offer direct connections anymore, this increases flight frequency to India and offers more Indian destinations to passengers. 4 February 2015: South African Airways has received their thirteenth consecutive 4-star rating from Skytrax. “Awards demonstrate that the airline can rightfully stand its ground as one of the leading airlines in the world, despite the challenges it faces. Our customers can continue to expect a high quality of product and service from us,” said Acting CEO Nico Bezuidenhout. Skytrax takes over 800 areas of product and delivery offered both at the airport and onboard into account when determining airlines' ranking. Skytrax rankings is a great strandard for travellers to measure airline services across the world. The 4-star ranking is the highest ranking an airline can achieve, placing SAA among some of the best airlines in the world. 30 January 2015: At today's press briefing Minister Nene announced: "We have approved the cancellation of the China route”. SAA have lost nearly R1 billion in three years on the Beijing route. They also named India as a loss making route. A further R8 billion losses has been attributed to fuell hedging. Lets hope they can curb the costs. Air China will take over the direct Beijing route from May this year, with SAA suspending flights from April 2015. 26 January 2015: South African Airways has cancelled all of their flights to and from New York due to bad weather in New York. All flights to and from John F Kennedy International Airport in New York have been cancelled. The US city is bracing for a blizzard that is set to hit the city on Monday. The blizzard will reportedly be one of the biggest storms to hit New York in recorded history. City officials have said a blizzard "the likes of which we've never seen before" will be hitting the North West of the US late on Monday afternoon. The airline said that they will keep an eye on the situation and start flying again to New York once the weather clears. Effected passengers can call the SAA call centre for assistance and updates at - 011 978 2888. 20 January 2015 : SAA today announced that they are on track with their 90 day turnaround strategy. This strategy has seen them strengthening ties with Virgin Australia and Etihad, even adding direct SAA flights to Abu Dhabi. Nico Bezuidenhour said, "Network optimisation is key and we expect to make more announcements regarding commercial efficiencies in the near future." Is he hinting at the rumoured cutting of the Beijing route? Nico also says that there is also improved interaction between the Board and management which improves governance. The general meeting will take place late January or early February. They have until the 24th of March to implement this plan after which the airline's future will be determined. January 2015 : It has been on the cards for years but it seems that 2015 will be the year in which SAA's biggest loss making route will finally be getting the cut. Plans are underway for Air China to take over the route, with them already requesting designation to operate on the route to South Africa. Air China will reportedly take over the route from 31 March 2015. This move is deemed to be very important as SAA implements their 90-Day Action Plan, which might very well be their last chance. We will wait with baited breath for the official announcement. December 2014 : Acting SAA CEO Nico Bezuidenhour unveiled his 90 day Turnaround Strategy for SAA yesterday. The immediate focus is on the airline's liquidity and offering assurance to Shareholders. This will be followed by cutting all loss making routes. Nico mentioned the danger of stepping on toes as some routes are "politically sensitive". Need we say more than China? They will also be looking at reconfiguring some routes to save money. All this is scheduled to take place over the next thirty days. Nico stressed that none of his plans involved major retrenchments which some feel is necessary to cut cost. They will also evaluate the possibility of taking on an equity party, like Etihad Airways for example, to provide the airline with some much needed funds. Step 3 and 4 are perhaps some of the most important as they will try to sort out the governance of the airline and eliminate contractual obligations that impose a massive burden on SAA. Nico also assembled a "War Cabinet" which will meet twice monthly to discuss the progress made and assist him with the difficult task at hand. Some are concerned that the turnaround strategy makes no mention of working on improving service which is a major reason passengers choose to fly on other airlines. We hope to see this plan followed through with all the necessary steps taken to make our national carrier profitable again. December 2014 : SAA might have struck a little luck with oil prices taking a dip recently. Some say that these small saving will help SAA in the long run as it strives to become profitable. SAA will also be implementing a new navigation approach, RNP-AR (Required Navigational Performance-Authorisation Required), which helps airplanes follow a more efficient flight path as it comes in for landing at airports. So far this has only been approved for use in SA, Seychelles and Brazil although the USA is also expected to follow shortly. SAA have installed this technology on its Airbus A319 and six Boeing 737-800 aircraft whilst the new Airbus A330-200 and A320 fleet is already equipped with this technology. The combined savings of a more fuel efficient route with the reduced fuel cost should benefit the airline. 24 October 2014 : Whilst it is still unclear whether government will rescue SAA with another bailout SAA have set about reforming their board. After six resignations and the appointment of Doctor John Tambi and Anthony Dixon, Minister of Public Enterprises Lynne Brown is confident that they will bring about all the necessary changes. Doctor John is a transport infrastructure specialist with an MBA and a Doctorate from Transportation Planning and Engineering Polytechnic University. They also appointed a chartered accountant Anthony Dixon with 29 years experience. Whilst these employments do seem to be a move in the right direction the retention of Duduzile Myeni as the Board Chairperson has been quite controversial. The accusations levied against Myeni include the fact that he doesn't serve the SAA board full time, that he is politically motivated and that he hasn't been able to make the tough business decisions required of him. Despite doubt about SAA's capability to turn things around a government bailout seems to be a reality in the near future. 1 September 2014 : SAA has now implemented new regulations for passengers who have to travel to Ebola affected West African countries. The South African government has advised South Africans not to travel to Ebola affected countries except if it absolutely essential. This announcement from the South African government has caused SAA to implement a new regulation for travellers who want to travel to Ebola affected countries in which travellers have to get permission to travel to countries like Liberia, Guinea or Sierra Leone from the department of health. If you want to travel to these countries you have to send your request to the following email addresses nathoc1@health.gov.za and nathoc2@health.gov.za. You will then get a written response from the Department of Health which you will have to produce to SAA, only essential travel will be allowed. 13 January 2015 : SAA flights to Mauritius had to be cancelled today due to tropical storm Bansi causing heavy winds. Travellers are advised to contact the airline or their travel agents with regards to being rescheduled. Flights will resume as soon as the storm passes, which could be as early as tomorrow. 21 November 2014 : SAA and Virgin Australia have signed a deal that will allow members of both airlines' frequent flyer miles to earn and redeem points across both airlines. Elite members will also be able to enjoy other benefits like lounge access and priority check-in. 21 November 2014 : SAA and technology company Sabre have signed a multi-year agreement which will make SAA’s airfares available in the GDS. Sabre travel agencies will now have access to the airline’s full range of fares, availability and schedules. 7 August 2014 : SAA has partnered with Boeing to create a unique jet fuel from a tobacco plant. They are currently test-farming the nicotine-free plant, known as Solaris, in South Africa and expect the first fuel to be produced from this next year. This has the potential to significantly reduce SA's reliance on imported fuel. 20 June 2014 : SAA will be cutting back on flights to Mumbai. They currently fly daily to Mumbai but they have decided to only fly 6 times a week to Mumbai cancelling the Tuesday flight. This decision has been made because the demand for flights to Mumbai are in very low demand on Tuesdays. This new flight schedule will come into effect from the 1st of July 2014. 16 May 2014 : South African Airways just made your long-haul flights much more enjoyable with the launch of their social check-in app. The Social Seat Selector helps you select your neighbours on your flight according to your Facebook information. All that this easy tool requires of you is to check in using SAA''s online or mobi site. Simply select to share your Facebook details whilst checking in and choose the profile details you want to make available. You will then be able to see a seat map with other passengers’ information and location and choose who you want to sit next to, whether it be a potential business partner or someone with similar tastes in music. This can be done up to 90 minutes before a local flights or two hours before an international flight. Relief Pilot Development Program : The career of a pilot at a large commercial airline usually starts off as being a relief pilot, followed by progressions to junior 1st officer, senior 1st officer, Captain & finally senior Captain. A relief pilot serves as co-pilot, but only when the plane is cruising. Typically, a relief pilot is used on long international flights when the pilots take the breaks they are entitled to. The relief pilot is also referred to as a second officer, and is the 3rd in command after the Captain and the first officer. In the industry the job of relief pilot is looked upon as being rather dull, as one is not exposed to the interesting parts of being a pilot (ie take-off and landing). SAA are considering using the role of relief pilot to expose cadet pilots as early as possible in their careers to real flight experience - this will also allow the pilots to start building up their in-flight hours. To this end, they are thinking of allowing those who have successfully completed their first bit of training in their Cadet Pilot Training Programme, to act as relief pilots. The airline has confirmed that the minimum requirement of 250 hours to become a 2nd officer, will be adhered to. I'm not sure why we didn't include this in our travel predictions for 2014, as this tragedy reoccurs just about every year. Ground crew for flight SA 207 which landed in Washington Dulles on the 13th Feb 2014 got more than they bargained for, when they found a dead person in the landing-gear wheel of the Airbus A340 (at the time it was parked in a quiet part of the airport). The flights had taken off in Johannesburg and flew to Washington via Dakar. It's not clear whether the person got into the wheel well at OR Tambo International Airport, or in Dakar. 22 January 2014 : On 22 Jan 2014 a trial was started at OR Tambo, with 105 Bagport staff & 27 wrapping machines set up to plastic-wrap luggage, but then on the 24th January the Bid Adjudication Council withdrew its go-ahead of the trial. The issues are that ACSA have said that only the licensed 3 wrapping contractors may bid (SAA left them out), and one of ACSA's licensed contractors, BidAir, have questioned why they weren't allowed to take part in the tender. To add to the complications, SA Express want to create a subsidiary to also do the plastic-wrapping. South African Airways are now going to put the licensing out to tender again, with Bagport, the 3 ACSA licencees and SA Express taking part. There's been some unhappiness about the airline having already included the cost of the bubble-wrapping in its fares, but SAA have always been able to vary their airfares as they wish, with customers free to switch to other airlines if they feel the fares are too high. Sometimes on the web you read absolute and utter rubbish. This article from Silicon India News, for example, says that "SAA's air safety record is amongst the worst in the world. It had some very bad crashes in recent years. South African Airlines came up in 9th place with one hull loss and 159 dead". This is complete nonsense - the truth is that SAA have had no crashes since 1987. The hull loss they are referring to, is flight 295 (the Helderberg) which crashed off Mauritius in 1987, a different era. 1 February 2014 : South African Airways is in talks to purchase at least 30% of Senegal's national carrier, after being approached by the Sengalese authorities. 7 January 2014 : SAA increases its airfares on regional African flights, excluding flights to Namibia and Nairobi. 18 December 2013 : South African Airways Alerts Customers of E-mail Phishing Scam "We would like to advise you as our valued customer that there is currently a phishing scam underway which, amongst other companies, targets our customers as a way of getting to your credit card and Voyager log-in details, as well as personal information. The scam involves e-mails with the subject given as: PASSENGER ITINERARY RECEIPT, “thanking” customers for their purchase, stating that their booking is confirmed, giving a booking reference number, as well as the credit card charge and then asking the customer to follow a link. As our customers we would like to advise you that these e-mails are NOT from South African Airways (SAA), or our Customer Care department as is wrongfully stated in the e-mail. SAA customers are also being advised that should they receive such an e-mail they should delete it immediately and not enter any personal information. SAA further advises customers that, no matter how authentic such e-mails may seem, any e-mail supposedly from the airline that has a link to an Internet banking sign-on page, or a page requesting any personal or banking information, is not from SAA. Furthermore, to never click on such a link as it will take you to a fraudulent website where your banking details, including a PIN or customer selected PIN may be compromised. SAA will never include a link that takes customers directly to a log-in page." 12 December 2013 : South African Airways switches to larger planes on flights to East London, Johannesburg and Cape Town. “The beginning of the festive season coincided with school holidays and most people tend to travel to go on vacation. The frequencies on these routes will remain the same. What has changed, is that we have deployed bigger aircraft on specific days, thus increasing capacity and enabling us to meet the demand,” said Tlali Tlali, SAA spokesman. 7 December 2013 : SAA pays tribute to Nelson Mandela. "We salute Tata Nelson Mandela as the father of South African democracy, and acknowledge that South African Airways (SAA) today is the leading carrier on the African continent due to his iconic and legendary statesmanship...In his memory we will continue taking our country's proud flag of freedom and our icon's legacy across the globe. It is because of this father of many nations that SAA is able to help build South Africa into a country that we can be proud." Extract from South African Airways' Chief Exec, Monwabisi Kalawe, tribute. December 2013 is the starting month for being able to use SAA Voyager miles to redeem Mango Airlines flights (however, you still can't earn Voyager miles on Mango flights). 3 December 2013 : South African Airways questionnaire, set up with the University of Pretoria, in which they are looking to improve their Voyager programme. 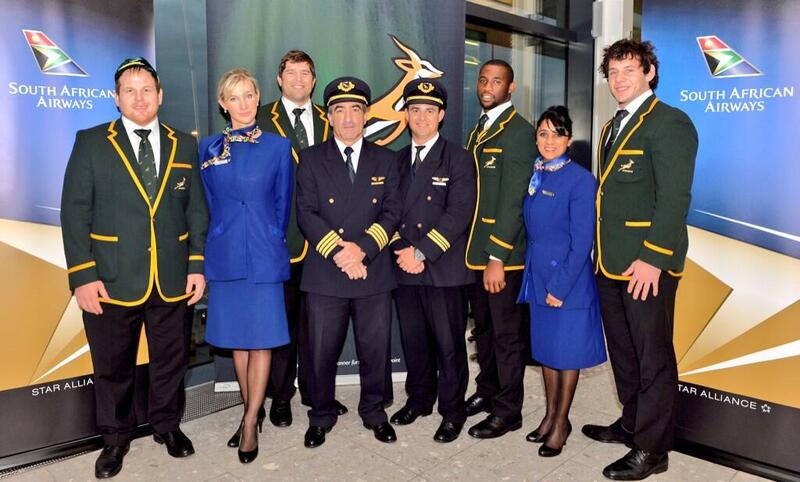 November 2013 : SAA photo of the successful Springboks after the end of year tour. 5 November 2013 : It's reported in ETNW that South African Airways plan on cancelling their Johannesburg to Buenos Aires flight route; but must continue its Johannesburg to Beijing route on advice from government (even though it is loss-making). 10 October 2013 : SAA & Boeing are going to work together to produce a supply chain of sustainable biofuel in South Africa. They are looking for ways which wont be in competition with others for water or food. 26 September 2013 : The Annual Report for the Department of Public Enterprises is released. The report says that the "objective to link South Africa to other fast growing African states has been incorporated into the LTTS" (which will be completed in 2013/2014). SAA paid an international consultant R1.7m for working 150 days on an SAA diagnostic study (which presumably feeds into SAA's Long Term Turnaround Strategy). The DPE & the Board of SAA did not agree to targets at the start of 2012/2013, because the DPE did not accept the Board's proposed budget loss. The report refers to the R5.06bn guarantee provided to SAA to help with working capital requirements and allow its financial statements to be submitted reflecting a going concern (Reference is made to Comair's application challenging the R5bn guarantee, and it's made clear that SAA & Government are opposing this challenge). Malusi Gigaba, the Minister of Public Enterprises, draws attention to the low margins in the aviation industry, the changes in leadership at South African Airways and its poor financial performance, as well as the awards won by SAA, its solid performance at an operational & technical level and confidence in its new leadership and its turnaround plan. Reference is made to Mr Vuyisile Kona, the former Chairman of SAA, whose services were ended in Feb 2013 - Mr Kona is requesting that his termination be set aside, and the DPE is opposing this matter. The report says that the impairment for SAA was increased from R3.2bn to R4.4bn. 11 September 2013 : In a speech to parliament yesterday, the Minister of Public Enterprises fleshed out SAA's Long-Term Turnaround Strategy. In particular, they plan to create an entity called "SAA Group Holdings" which will be responsible for operating the individual airlines: Mango, SA Express and South African Airways. Mango aims to be Africa's "leading world class low cost carrier", SA Express aims to be "Africa's world-class regional feeder airline" and South African Airways a "full service world-class premium carrier". The Minister draws inspiration from Kenya, Ethiopia and the UAE where there are holistic state aviation policies revolving around: airports, airlines, visa requirements, traffic rights for foreign carriers and buying planes. The DPE is already busy formulating a "Fly South Africa Policy" similar to the "Fly America Act" which forces Government officials to use state-owned airlines. It seems South African Airways has asked for help with its decisions on whether to fly to Beijing & Mumbai, as stopping flying there would have "far-reaching diplomatic implications" given the objectives of the BRICS - Government must identify all strategic routes (the reality is SAA may be forced to fly routes which are strategic but not profitable). 28 August 2013 : SAA released a travel advisory reassuring passengers that there have been "minimal disruptions" as a result of the striking action of SAA Technical staff. Passengers should keep an eye on their flight status, in case of a deterioration of the situation. 17 July 2013 : South African Airways staff who are members of Satawu go on strike. Satawu said in a statement that the "recalcitrant management of SAA has unilaterally implemented their rejected initial offer of 6.23% of basic salary and all other benefits while the negotiations were still ongoing." Workers are demanding an 8.33% increase, and are upset that (mostly white) pilots get a 15% increase. South Africa Airways says the strike is "despite parties having agreed in principle to the 6.5 percent across the board offer...SAA is of the view that Satawu is deliberately misrepresenting facts with the intention of misleading its members and inciting a section of the airline's employees to embark on the strike action on matters that are not relating to the wage negotiation process. The misunderstanding and miscommunication presented by Satawu is regrettable, particularly pertaining to the bulk of employees who have indicated their willingness to accept the above offer." 16 July 2013 : According to FlightStats, South African Airways was the most on-time airline in the world in June 2013. Runners up were Gulf Air, ANA, Japan Airlines, Finnair, Tyrolean Airways, KLM, EasyJet, Korean Air Lines and Iberia. 24 April 2013 : Following a partnership with Quovadis, a company owned by Airbus ProSky, SAA starts implementing RNP-AR procedures (Required Navigational Performance - Authorisation Required) in order to reduce travel time and save fuel. 15 April 2013 : Voyager miles can now be accrued/redemeed on Cruises International Bookings. 9 April 2013 : SAA have launched 2 mobile apps that allow passengers to view reservations information, allow check-in, shows the status of checked-in baggage, info on lounges, flight status & destinations. The apps can be downloaded from Google play stores & the Apple App Store. “This new service will go a long way in giving travellers easier and instant access to information whilst in transit or away from a computer. The new functionalities are also helpful especially for passengers who are always on the go such as business travellers. This is another way of ensuring convenient travelling for our valued customers. As a global airline, we consistently seek ways to make flying with SAA ever more convenient. Our customers now have the option of by-passing the queues and breezing through the terminal by using either mobile check-in, on-line check-in, or print-your-own boarding pass features. This is the type of service that air travellers have come to expect from Africa’s most awarded airline.” says South African Airways' Mr M Cavaliere. 4 April 2013 : Rent a vehicle with Europcar on the SAA website before 31 May, and you stand a chance to win a 2012 Kia Picanto 1.0L manual (the rental must have been completed by 31 May 2013). 2 April 2013 : South African Airways proposes a strategy to Malusi Gigaba, the Minister of Public Enterprises, whereby it will return to profitability. It is understood that this entails a review of existing routes, seeking synergies with Mango Airlines & South African Express, and a possible "right-sizing" of the airline & subsidiaries. 13 March 2013 : SAA lays a complaint with the Advertising Standards Authority about the Kulula "Most South African Airways" advert. 9 March 2013 : Seventeen year old Fatoumatta Kaba gives birth on an SAA flight from Johannesburg to New York, with the assistance of an American doctor. "I wasn't scared to have the baby, I was very happy. I feel better now after delivering the baby. Everything's OK." said Kaba. A South African Airways spokesperson said "(Ms Kaba) was dressed in such a manner that on plain view there was no way you could have detected that she was pregnant." February 2013 : SAA are introducing Chef Benny Masekwameng's dishes onto their longer regional and international flights. South African Airways' General Manager, Manoj Papa, said that "We are excited about our partnership with seasoned Executive Chef Benny Masekwameng and are confident that his expert advice on our regional and international Premium Class menus will delight our customers' discerning palates." December 2012 : Noise cancelling headsets are made available in business class. SAA's Product Manager, Ms M Bracke, says that "This is a major step towards improving the quality of the in-flight entertainment experience and in line with what some other big airlines offer customers on board." An amenity kit is also added which contains a comb/brush, full-length toothbrush, shades, socks & cosmetics. 26 October 2012 : South African Airways is one of 12 airlines taking part at the 2012 The Taipei International Travel Fair. The other airlines are All Nippon Airways, China Airlines, Eva Airways, Hawaiian Airlines, Hong Kong Airlines, Japan Airlines Corporation, Mandarin Airlines, TransAsia Airways, Turkish Airlines, UNI Air & Vietnam Airlines. Each piece of oversize baggage"
September 2012 : SAA's inflight magazine on "Mumbai, Gateway to India"
6 June 2012 : The Competition Tribunal and South African Airways agree on a penalty of R18.8m for fixing fuel rates & other surcharges on the flying of cargo from and to SA. 26 Mar 2012. The Competition Commission rules that Singapore Airlines & SAA have to pay fines for fixing flight prices on the Johannesburg - Hong Kong route. Singapore Airlines must pay R25.1m and South African Airways R18.8m. The investigation started in 2008 after Cathay Pacific applied for leniency. Under the settlement, cases against South African Airways with respect to pricing strategies for the 2010 Fifa World Cup, and collusion in international cargo charges & domestic route prices are being dropped. 24 Feb 2012. A South African Airways plane skids off the runway when it lands at Sao Paulo Airport. No passengers are injured. 16 Nov 2011. Change to South African Airways' Passenger Service Charge. Definition : Levied on all passengers departing on international and/or domestic flights from South African Airports. Please note that all tickets issued prior to 03 OCT 2011 for travel commencing on/before 31 DEC 2011 and return travel on/after 01 JAN 2012, taxes to be levied will be the combination of the two applicable taxes. In the case of a ticket with a domestic flight and a transfer to an international flight (e.g. PTG-JNB-LHR), for all tickets issued and for travel commencing on/before 31 DEC 2011, ZAR 227.00 must be levied, i.e. ZAR 177.00 (International) + ZAR 50.00 (Domestic). For travel commencing on/after 01 JAN 2012, ZAR 349.00 must be levied, i.e. ZAR 299.00 (International) + ZAR 63.00 (Domestic). The same principle is applicable for domestic departures linked onto departures to a Neighbouring Country (see b) above). - Infants under two (2) not occupying a seat. - Passengers who do not disembark from an aircraft after such an aircraft has landed at an airport and who remain on board that aircraft until such aircraft takes off from that airport. 11 August 2011 : South African Airways alerts clients about a phishing scam: "We would like to advise you that there is currently a phishing scam underway which, amongst other companies, targets our customers as a way of getting to your Voyager log-in details, as well as personal information. The scam involves e-mails with the subject given as: PASSENGER ITINERARY RECEIPT, "thanking" customers for their purchase, stating that their booking is confirmed, giving a booking reference number, as well as the credit card charge and then asking the customer to follow a link. Please be advised that these e-mails are NOT from South African Airways (SAA), or our Customer Care department as is wrongfully stated in the e-mail. SAA advises you to immediately delete such an e-mail and not enter any personal information. No matter how authentic such e-mails may seem, any e-mail supposedly from the airline that has a link to the Voyager log-in page, is not from SAA. In addition, please do not click on such a link, as it will take you to a fraudulent website where your Voyager log-in and your PIN may be compromised. If you have transacted via the SAA website using your Voyager log-in details during the last 72 hours and are unsure of the legitimacy of the transaction, please contact our call centre on +27 11 978 1234 during office hours (07h00- 21h00) to reset your selected Voyager PIN." July 2011 : ACSA stats demonstrate that SAA was the most on-time airline in July 2011. 58 SAA planes are specially branded with the Nelson Mandela Day logo (picture of Mandela with his fist in the air) for Nelson Mandela's 93rd birthday; on the head rest covers and on the outside of the aircraft. Achmat Dangor, Nelson Mandela Foundation chief, says that "By this initiative, this means SAA will expose its passengers about the Mandela Day message and hopefully they will spread the message to their families and friends." Due to volcanic ash, SAA cancels flights from and to Cape Town, East London and Port Elizabeth. SAA Cape Town - Durban flights stopped, code-share on Mango Airlines continues. Cheapest SAA Oct flights for each day in October 2010, R660 from Johannesburg to Port Elizabeth. SAA KPMG report on irregularities at SAA. SAA Bafana Bafana sale for the Fifa World Cup. SAA is named official carrier of the US World Cup team. South African Airways agrees with Airbus to lease 6 new long-haul A330-200 aircraft in 2011, replacing SAA's existing and ageing A340-200s. The SAA website experiences downtime as a result of SAA not renewing it. SAA flight 601 from Durban to Cape Town rejects takeoff after an engine ingested a bird (a yellow-billed kite). The plane was an Airbus 319-100. Passengers disembarked in Durban and were flown to Cape Town on another flight. It is announced that SAA purchased 40% of CEMAC Airline, following failed talks with Brussels Airlines and Royal Air Maroc (RAM). CEMAC is the Central African Economic and Monetary Community, consisting of Cameroon, Chad, the Central African Republic, Congo, Equatorial Guinea and Gabon. An SAA flight from Johannesburg to Port Elizabeth, returns to O.R. Tambo International Airport and makes an emergency landing after an oil leak is discovered. SAA plane pulling the big five and Santa on a sled. The Times newspaper accuses Khaya Ngqula, the SAA chief executive, of issuing Voyager miles to a private investigator he hired to spy on his staff, in violation of the company's policies. SAA announces that it will be outsourcing its call-centres (including reservations and Voyager). Caught on the receiving end of some shabby treatment from South African Airways, Justin Hartman starts a site at saasucks.com (the name says it all!) - link removed as it stopped working. SAA requests R2.9bn from the SA government. Elsabé Manning takes an SAA flight to Windhoek (Namibia), but unfortuanately her luggage does not get there. Manning, the owner of the Success Factory, later sues SAA for R200,000 as she was forced to present in casual clothes and without the books which she was going to give as gifts to the audience. SAA reports a net loss of R1.09bn for the year to 31 March 2008 (excluding restructuring costs there was a profit of R123m). SAA cut 1196 jobs. After receiving a tip-off from Brazilian police, police at Johannesburg Airport (OR Tambo) find 120 kilograms of cocaine in the cargo section of an SAA aircraft travelling from Sao Paulo to Johannesburg. The final destination of the cocaine was Durban. Swissport international takes over the ground handling of South African Airways flights. UCT students take the piss in their Sax Appeal article, "South African aircrimes"
Following the evidence given by Nationwide Chief Executive, Vernon Bricknell, to the court; SAA pays Nationwide Airlines an undisclosed amount to settle the issue of it getting sued for anti-competitive behaviour. Following the departure of Captain Colin Jordaan (to head up the South African Civil Aviation Authority), SAA appoints its Chief Pilot, Captain Jonny Woods, as its Head of Flight Operations. Woods joined SAA in 1974, becoming a training Captain in 1981 and Chief Pilot in 1998. An SAA plane gets its nosewheel "stuck"in the sand, at Cape Town International Airport, after mistiming a turn while taxying. South African Airways pays R55 million to South Africa's Competition Commission, as a result of price-fixing and other anticompetitive actions. Transnet summaries the losses which SAA have caused since 2004: "In summary, since 2004 Transnet has injected, out of its own funds, R8,4 billion in cash (into SAA) which has now been written off." From the 1st January 2005 to the 31st January 2007, 24% of SAA's international flights were delayed and 23% of domestic flights were delayed. Transnet concluded a share sale agreement with the Department of Public Enterprises for the sale of Transnet’s shares in SAA with effect from 31 March 2006, subject to the fulfilment of certain suspensive conditions. A sale price of R2 billion was based on an independent valuation. The suspensive conditions included the enactment of a law setting up South African Airways as an independent company, Air Services Licensing Council approval, International Air Services Council approval, third-party contractor approval and the listing of South African Airways as a Schedule 2 public entity in terms of the Public Finance Management Act (PFMA). All the suspensive conditions were fulfilled and Transnet recorded the disposal of SAA in its annual report to 31 March 2007. South African Airways is fined R45 million for trying to stop travel agents from dealing with SAA's competitors. SAA becomes a full member of the Star Alliance (having applied for membership in March 2004) and the first African airline to join the alliance, boosting its numbers to 18. One of the conditions which they abided by, was to paint a a B737-800 and an A340-600 in the Star Alliance's colours. A Competition Commission tribunal fines SAA R45m for anti-competitive behaviour, after ruling that South African Airways' incentive schemes for travel agents was an abuse of its dominant position designed to impede competitor airlines in South Africa. The Sunday Times reveals how Khaya Nqgula made 15 helicopter rides to meetings in Gauteng which were within driving distance of each other, at a cost of more than R4000 an hour. Mr Dan Moeti and Mr Kyri Acton appointed Chief Risk Officer and Chief Operating Officer (respectively) of SAA. The SAA board approves project Bambanani (a Zulu word meaning "working together holding hands"), a corporate strategy to return SAA to profitability through three pillars: (1) a cost reduction program, (2) re-aligning the skills of SAA's staff to the needs of the business, (3) setting up an enterprise risk management system. Dr Khaya Ngqula joins SAA as Chief Executive Officer and member of the board. Andre Viljoen resigns as Chief Executive Officer of South African Airways, and also resigns as a member of SAA's board. In its 1st ever purchase of a stake in a foreign airline, South African Airways buys 49% of Air Tanzania for USD20m. On 4 October 2001 Swissair filed for a moratorium of debt enforcement, with the Zurich courts, which appointed a provisional Administrator over the SairGroup. The appointment of a provisional Administrator constituted an "event of default" in terms of the Shareholders Agreement between Swissair, Transnet and SAA, entitling Transnet (if not remedied) to various contractual remedies under the Shareholders Agreement including the right to terminate the shareholders agreement and reacquire Swissair's 20% shareholding in SAA at a price of 85% of the current value of such shares. Swissair acknowledged the event default and informed Transnet that it was not in a position to remedy the event default and waived any rights to be afforded a 30 day period provided for in the shareholders agreement in which to remedy the event of default. As a consequence, Transnet became entitled to terminate the Shareholders Agreement and to re-acquire the 20% in South African Airways at 85% of the Fair Value of such shares. On 2 November 2001, Transnet issued a termination notice in terms of the Shareholders Agreement of which the effect was to implement the procedure for the reacquisition by Transnet of Swissair's 20% shareholding in South African Airways. At a special Board meeting of Transnet on the 18th October 2001, it was resolved that Transnet should exercise its right to terminate the shareholders agreement and re-acquire Swissair's 20% shareholding in South African Airways. South Africa's Cabinet endorsed this strategy on 21 November 2001. Andre Viljoen is named Chief Executive Officer of South African Airways. South African Technical is incorporated as a seperate company with its own board of directors. SA064 leaves the runway on landing at Lusaka. There are no deaths and no injuries. SAA acquires 21 Boeing 737-800s. SAA introduces its new Cycad first class lounge. Thabo Mbeki (South African President) announces SAirGroup, the parent of Swissair, had agreed to purchase 20% of South African Airways from Transnet (Swissair also had an option to buy another 10% of South African Airways). The agreement had been signed in London by P Bruggisser (SAirGroup's Chief Executive Officer) and S Macozoma (Managing Director of Transnet). , SAirGroup had purchased its stake for R1.4-billion. SAA becomes a proprietary limited company, being renamed South African Airways (Pty) Ltd.
South African daily newspapers announce that Michael Myburgh is being axed, and that Coleman Andrews, a "43-year-old American spin-doctor" will be joining SAA as its Chief Executive. SAA launches a "frequent freighter" program. SAA starts selling plane tickets online. An alliance is formed between SA Airlink, SA Express and SAA. SAA unveils "Ndizani", a specially multi-coloured 747 for use during the Olympic Games in Atlanta. A new African airline, Alliance Air is launched in Dar es Salaam, Tanzania. This is a three-way venture between SAA & the governments of Tanzania & Uganda. SAA introduces multi-lingual greetings on board domestic flights in English, Zulu, Sotho and Afrikaans. On international flights, passengers are greeted in the relevant destinations language. SA Express is granted a licence to operate domestically and SAA becomes a shareholder. Michael Myburgh replaces Gerrit van der Veer as Chief Executive Officer. Parliament approves the deregulation of the domestic air travel market. South African Airways is made a division of Transnet (100% owned by the South African government). SAA museum is opened at Jan Smuts Airport (later to be renamed Johannesburg Airport, and later still to be renamed OR Tambo Airport). SAA flight 295 from Taipei (Chiang Kai Shek Airport) to Johannesburg, the Helderberg, crashes near Mauritius, losing all 140 passengers and 19 crew on board. Business class is introduced on domestic flights. South Africa's first identified AIDS patient, an SAA flight attendant, dies. An express cargo service is introduced on domestic routes. An SAA Johannesburg-Lisbon-Rome-Athens flight, becomes the world's first commercial flight using a Boeing 747-SP. SAA opens a lounge at Jan Smuts Airport, for its first class passengers. SAA's first landing at Victoria Falls Airport with a Hawker Sidley 748 aircraft. In the first hijacking of an SAA aircraft Fouad Kamil (aka Flash Fred, a Lebanese diamond agent) and Abou Yaghi, armed with sticks of dynamite, force South African Airways Captain Blake Flemington to land his Boeing 727 in Letaba (it was on its way from Rhodesia to Johannesburg. Kamil's demand was that Anglo American Chairman Harry Oppenheimer meet them at Chileka Airport in Blantyre. Once the majority of the passengers and Flemington had escaped and the plane was surrounded by Malawian troops, Kamil and Yaghi surrendered, and spent a few months in jail before being released. SAA's first a Boeing 747B, ZS-SAN "Lebombo" arrives at Jan Smuts Airport. Jan Smuts International Airport is opened near Kempton Park and SAA's Skymaster "Tafelberg" performs the first official landing there. Palmietfontein becomes the Johannesburg terminal for all SAA services. SAA introduces air hostesses on aircraft that serve internal destinations. The International Air Transport Association is founded at Havana. SAA is one of 44 active founding members. SAA becomes a military wing and all commercial services are suspended. SAA moves from its headquarters in Durban to Rand Airport, Germiston. SAA purchases South-West African Airways, and inherits 2 Junkers A 50 and a Junker F13. SAA introduces Junkers Ju52/3m, the first multi-engined aircraft used on South African local services. The aircraft was configured to carry 14 passengers and a crew of 4. After purchasing the assets & liabilities of Durban-based Union Airways, the South African government renames it South Africa Airways (SAA). During 1934 SAA operates flights between Cape Town, Johannesburg and Durban. SAA fell under the control of South African Railways and Harbours. The Fokker "Red and Yellow Monster" crashes. Union Airways begins transporting passengers in the Fokker "Red and Yellow Monster". The first passenger on a South African commercial flight, Dr RD Laurie, becomes violently ill shortly after takeoff from Port Elizabeth. Laurie recounts the experience: "In those days there were no paper bags, and no soft-handed hostesses to stroke a man's fevered brow, you know. I slid open a small glass side window and stuck out my head. To vomit against a 120-mile wind was no easy matter." Union Airways is founded by Major Allister Miller (known for recruiting about 2000 South African for service in the Royal Air Force in World War I), as an internal South African airmail carrier flying DH60 Gipsy Moth biplanes. Union Airways was initially based in Port Elizabeth (Fairview Aerodrome), but operated flights between the main centres of South Africa. JNB-Lagos Frequency Increased. SAA increases its Airbus flights between Johannesburg and Lagos, Nigeria to 8 times a week. JNB-Kinshasha Frequency Increased. SAA increases flights between Johannesburg and Kinshasha from six to seven a week. JNB-Dar Es Salaam Frequency Increased. SAA increased flights from 12 to 13 a week. JNB-Lusaka Frequency Increased. SAA increases flights between Johannesburg and Lusaka from 20 to 21 a week. JNB-Harare Frequency Increased. SAA is increasing flights between Johannesburg and Harare, from 18 to 20 a week. SAA restarted its JNB to Blantyre flights on the 26th March 2014 (South Africa Airways had suspended its Blantyre flights as the runway at the airport needed to undergo emergency repair work). Accra Service Increased to Daily. A Wednesday flight is added to the Johannesburg to Accra (Ghana) flight route making it a daily service. All flights are in A330-200s. SAA increases its flight frequency from Johannesburg to Dar es Salaam from 11 to 12 flights a week. SAA adds a 7th weekly flight from JNB to Mumbai, making it daily flights. South African Airways adds a 6th weekly flights between Johannesburg and Mumbai. SAA commences flights between Johannesburg & Beijing, China, using an Airbus A340-600. Flying time is some 15 hours, and the flight leaves JNB at 08h00 on Tuesdays, Fridays and Sundays. The return flight leaves Beijing on Mondays, Wednesdays and Saturdays at 06h40 (arriving at JNB at 15h40 the following day). SAA commences direct flights from Johannesburg to Kigali (Rwanda) and onward to Bujumbura (Burundi) in an A319 aircraft that can accommodate 120 people in a 2-class (business and economy) configuration. SAA launches flights to Bujumbura (Burundi, 3 times a week),Cotonou (Benin, twice a week) and Kigali (Rwanda, 3 times a week). A319 aircraft will be used. The airline will withdraw from the JNB - Gaborone route effective from 7 August 2011, and SA Express will increase its frequency with a smaller gauge aircraft. SAA begins Johannesburg to Ndola flights. South African Airways starts flying Johannesburg to Beijing, following SA having joined the BRICS (Brazil, Russia, India, China and South Africa). SAA plans to increase their flights between Johannesburg and Buenos Aires to 3 a week. SAA to introduce non-stop flights on the Johannesburg - New York route. SAA starts flying the Johannesburg - Douala route (2 weekly). SAA's first flight from Johannesburg to Buenos Aires (Argentina). SAA start off with twice-weekly flights on the route. SAA adds on extra weekly flight on the Libreville - Johannesburg route. SAA launches its Johannesburg - Munich route with 3 flights per week. Flights between Johannesburg and Zanzibar (Tanzania) and Johannesburg and Livingstone ( Zambia) commence. Four times weekly flights between Washington and Johannesburg commence. SAA stops flying its own metal between Sydney and Johannesburg, as a codeshare is entered into with Qantas (this would be terminated by Qantas in Feb 2014 after SAA entered into a codeshare with Virgin Australia). Flights to Buenos Aires are relaunched and flights to Copenhagen are discontinued. Flights from Johannesburg to Lagos (Nigeria) are launched. Flights from Johannesburg to Singapore are stopped. Flights to Hamburg and Manchester commence. Introduction of twice weekly flights to Dubai. Flights to Singapore and Bangkok are launched. Flights from Cape Town to Miami are launched. SAA's first scheduled flight to Cairo, since 1 Nov 1956. SAA relaunches flights to Australia. SAA makes its first flight to Moscow (Russia), to pick up the Moscow circus. SAA flights between New York and Johannesburg resume. For the first time in 28 years, SAA flights are allowed over Sudan and Egypt. South African Airways receives its first Boeing 747-400 and Airbus A320. Flights between Perth and Johannesburg are stopped, as are flights between Sydney and Johannesburg, after the Air Services agreement between the South African and Australian government is terminated. As a result of US economic sanctions, flights between New York and Johannesburg are suspended. The US also withdraws from its landing rights in South Africa. Flights to Buenos Aires are stopped. A three-class service is introduced for flights to Australia - Blue Diamond First Class, Gold Class for Business Passengers and Silver Class for Economy class passengers. First weekly flight between Johannesburg & Taipei via Mauritius. Introduction of a weekly return service between Johannesburg & Mauritius via Durban with a Boeing 707 156-seater. SAA's Boeing 747-SP makes its first scheduled flight between Johannesburg and Sydney, Australia. The flight offers movies and audio on 5 channels. Flights from Johannesburg to New York are launched (via Rio de Janeiro), in SAA's Boeing 707 "Bloemfontein". The first flight between Johannesburg's Jan Smuts Airport and Rio de Janeiro, takes place in a Boeing 707. A weekly jet service between Australia and South Africa is introduced. South African Airways' first 707 lands in Athens. Launching of flights to Australia (Perth). SAA begins weekly Johannesburg-Cairo services with DC-4s. A cinema is introduced on the direct services between Johannesburg and Cape Town and on Skymasters operating the Springbok route. SAA operated its first flight from South Africa to the UK (an Avro York flew from Johannesburg's Palmietfontein Airport to Bournemouth's Hurn Airport). The flight was via, Nairobi, Khartoum, Cairo and Castel Benito with overnight stops in Nairobi and Cairo. SAA extends the weekly Johannesburg-Lusaka service to Broken Hill, Nairobi and Kisumu. First regional service between Johannesburg, Pietersburg (now Polokwane), Bulawayo, Livingstone & Lusaka with Ju52/3m. SAA moves into Heathrow T2 : In June 2014 South African Airways and all other Star Alliance members are due to move into the new terminal 2 at London's Heathrow Airport (LHR). This will allow for shorter transfer times for passengers on connceting flights at LHR "In a year's time we will ring in a new era for our customers, member carriers and employees at London Heathrow. The purpose built Terminal 2 will be our home and will offer a superior travel experience to our customers, create new business opportunities for our member carriers and provide an improved working environment for employees." said the chief executive of Star Alliance, Mark Schwab. "We're very excited about today's announcement and the countdown to the opening of the new Terminal 2 at London Heathrow. Our move into Heathrow's newest terminal will offer SAA customers an unrivalled passenger experience both in the air and on the ground, harnessing new technologies and seamless connections with our extensive network to Southern Africa. Our move from our current home in Terminal One is set to take place from the autumn of 2014 and will give us a unique opportunity to build upon our reputation as Africa's most awarded airline." 15 Aug 2012 : SAA quits direct flights from Cape Town to London. 4 Jun 2012: Closing date for the SAA Paint the Plane competition, where school kids & students could win an all expenses paid trip to the London Olympics. 16 Feb 2009 : The entire crew of 15 of SAA234 are arrested in London Heathrow for possession of illegal goods. 20 Jan 2009 : An entire SAA cabin crew are detained (and later released) at London after 50kg of marijuana and 4kg of cocaine are discovered in luggage - see SAA drugs bust. 1983 : SAA's first non-stop flight between London and Johannesburg (enabled by the delivery of a Boeing 747-300 SUD). 2 Dec 1978 : SAA negotiates the purchase of 2 Boeing 747's, to enable direct non-stop flights between Johannesburg and London. 2 Aug 1968 : Flight BA129 VC10 from London Heathrow landed with fire engines deployed to avert risk. Aircraft landing gear lights had not come on and aircraft was circled above Johannesburg for an hour to use up excess fuel. Safe landing, no injuries. 4 Apr 1961 : A daylight flight to London and Paris is introduced, flying via Brazzaville & Rome. 1953 : South African Airways becomes the first airline outside the United Kingdom to operate a jet aircraft (BOAC's De Havilland Comet). The De Havilland Comet is used in SAA's Comet Springbok service from London to Johannesburg. 26 November 2014. After it came to light that SAA's new acting CEO Nico Bezuidenhout did not have a degree despite him and SAA stating that he did, SAA has come out and defended their appointment of Bezuidenhout. SAA Spokesperson Tlali Tlali said the following: "In the opinion of the Board, the tertiary studies that Mr Bezuidenhout has completed, although incomplete, provides sufficient grounding whilst his performance track record certainly exceed that of a number of previous, and highly qualified, airline CEO’s". Mr. Bezuidenhout also came out and said that it is not a secret that he does not have a degree. If so then why would they state that he did? The airline is however in good hands if you look at Bezuidenhout's track record at Mango. Mango recorded record profits this year and it was named as the best low cost carrier in Africa. Let’s hope he can bring his experience into SAA, despite not having formal tertiary education. 2013-06-03. Kona challenging dismissal. According to a Business Day report on Friday, Vuyisile Kona, the former chief executive of SAA, wants to challenge his dismissal in the High Court. Kona served as CEO from the 14th December 2012 until the 11th February 2013, possibly the shortest permanent posting to the position South African Airways has ever had. “This hasn’t been communicated to us by Vuyisile and comes as a surprise that he is taking us to court when we are still in the final round of disciplinary stages against him. Had the position been that the disciplinary process had concluded and he had been informed of the outcome thereof, and thereafter notified us that he was unhappy with the outcome and planned to challenge it, we would be in a better position to provide a more elaborate response in terms of the steps we would take,” said Tlali Tlali, South African Airways spokesman in ETNW. 19 Apr 2013. Monwabisi Kalawe is appointed Chief Executive of South African Airways. At the time of appointment Mr Kalawe was working out his notice for resigning as Executive Chairman of Compass Group South Africa (a food services company). Kalawe has previously also worked for Eskom, Nestle, ACSA, Total Facilities Management Company and Denel. "The incumbent holds overall responsibility for the profit-and-loss performance of the company, with direct accountability for all dimensions of the carrier including strategy, commercial, finance, human resources, government/regulatory affairs, legal, information technology and all aspects of operations including flight operations, technical operations, airport customer service, in-flight customer service and systems cargo and operations control. Given the strategic nature of the role, the CEO must lead an effective programme of liaison with key external constituent groups, including the Shareholder, policy departments, regulators, major suppliers, airport organisations, local community leaders and media to ensure that SAA’s interests are coordinated." Malusi Gigaba, Minister of State Owned Enterprises, on the appointment of Kalawe at SAA. 1 Apr 2013. Ndalo Media is appointed to publish Sawubona Magazine. The menu of Chef Benny Masekwameng, of Tsogo Sun, is introduced. Taittinger champagne is made available to business class passengers on international flights. 11 Mar 2013. The Board of SAA remove Mr Kona from the board: "This morning, the minister, as the sole shareholder, convened a shareholders' meeting in terms of section 71 of the Companies Act to consider a resolution to remove Mr Kona from the board...The minister ... has adopted a resolution removing Mr Kona from the board of South African Airways...It should be stated categorically that Mr Kona's innocence or otherwise of the allegations against him as acting chief executive had little bearing on the minister's decision to remove him." said Mayihlome Tshwete, the spokesperson of Public Enterprises Minister Malusi Gigaba. "In the Minister opinion, the relationship between the board and Mr Kona had deteriorated to a point where, it will not be possible for him to lead or function optimally either as a member and board chairperson. Ms Duduzile Myeni will continue to act as a Chairperson." 11 Feb 2013. South African Airways places its acting Chief Executive Officer, Vuyisile Kona, on precautionary suspension. "This is based on certain allegations that have come to the attention of the board, in respect of which the board has a fiduciary duty to investigate. It must be stressed that the board has not come to any conclusion as to the veracity or otherwise of these allegations. The board is confident that this process will be completed by 31 March 2013, at which time recommendations will be presented to the Minister." Mango Airline's Chief Executive, Nico Bezuidenhout, has been asked by the board to look after the group's operations. 14 Dec 2012. Malusi Gigaba, the Minister of Public Enterprises, with immediate effect appoints Mr Vuyisile Kona as Acting CEO of South African Airways (Kona was previously Executive Chairperson) and Ms Duduzile Myeni as Acting Chairperson: "One of the critical responsibility that the Acting Chairperson will be expected to embark upon is to reinforce leadership stability at SAA and initiate a robust recruitment process for the appointment of the new CEO to ensure continuity in the airlines business operations." 9 Oct 2012. New chairman, Vuyisile Kona, is taking over as chief executive, following the resignation of Siza Mzimela. The Chief Executive Officer of South African Airways, Siza Mzimela, resigns. Also resigning are the Commercial General Manager (Theunis Potgieter) and the Legal & Risk General Manager (Sandra Coetzee). “I have given this decision careful thought and feel that now is the best time to relinquish my position as your ceo and allow somebody else to pilot the company into the future. I leave with some sadness because I have thoroughly enjoyed being a member of the SAA family for almost three years – and will therefore miss the company and all of you. I have a sense of relief because steering this mega national asset is, to state the obvious, a very demanding and daunting task even under the best of times. But as many of you know, there has not always been a uniform understanding and appreciation of this mandate from stakeholders, which bred a myriad of challenges – as if the operating environment was not daunting enough without this unnecessary discourse and misinformation". Wholesale changes to the board: the Minister of Public Enterprises, Mr Malusi Gigaba, appoints Mr Vuyisile Kona as chairperson of SAA. Also appointed to the board are Messrs A Mabizela, A Khumalo, B Mpondo, Dr R Naithani, Ms C Roskruge, Ms R Lepule and Ms N Kubeka. South African Airways' Chairwoman, Cheryl Carolus, & 6 board members have quit (including Russel Loubser, 8 of their 14 board members have resigned). "After careful thought I also decided to resign, along with other members of the board." said Carolus. The 6 members who indicated to Carolus they would resign are Teddy Daka, David Lewis, Bonang Mohale, Jabulani Ndlovu, Louis Rabbets and Margaret Whitehouse. Russel Loubser, former Chief Executive of the JSE, resigns as a board member of South African Airways. Cheryl Carolus is appointed chairwoman of the SAA board by Public Enterprise minister Barbara Hogan, replacing Proj GJ (Jakes) Gerwel. It is announced that Khaya Ngqula, SAA's Chief Exectutive, has had his contract terminated. It later becomes known that SAA paid Ngqula R9.35m to terminate his contract early (he was paid a total of R13.65m in the year through to March 2009, as well as receiving “travel benefits” of 5 international flights, 90 domestic flights and 1 regional flight). Khaya Ngqula, SAA's Chief Executive, is sent on special leave (meaning he gets his full current remuneration), after the South African Transport & Allied Workers Union requested an investigation of procurement procedures. On the 16th Feb the Board appointed Chris Smyth, General Manager of Operations, as acting Chief Executive. SAA awards a R240-million tender contract to Starcom to handle its advertising & marketing. Billy Modise is a shareholder in Starcom Worldwide as well as being a member of the South African Airways board (joined mid-2006). In January 2009 it was ruled by the South Gauteng High Court that the awarding of the contract to Starcom be reviewed and set aside. Starcom is owned by Lobedu Communications Group, a company controlled by Modise’s Koni Media Holdings (in Nov 2006 Koni Media bought a 51% stake in Lobedu Communications) & Groovin Nchabeleng. 25 June 2013 : Gigaba on Need for Transformation> : Following the furore over the majority of cadets in SAA's program being black, The Minister of Public Enterprises has said: "Some in our country have complained that SAA, for example, is recruiting 33 black cadet pilots and only seven white cadets. Statistics indicate that SAA has 793 pilots and out of these 667 (85%) are white and only 124 (15%) are black (Africans, Coloureds and Indians put together). These statistics highlight the blatant fact that the rate and levels of transformation in this sector has been taking place at a painfully slow rate, and that there is critical need to increase the pace of transformation to address the significant levels of demographic and gender imbalance that are embedded in the aviation sector. Through the launch of this programme, the three state-owned airlines – namely, SAA, SA Express and Mango – will now strengthen their role as engines of economic growth in our developmental state, and as leaders in the transformation of the aviation sector in order to strive towards reflecting the diversity of the country in the skilled echelons of their workforce." 3 Jul 1995 : SAA's Cadet Pilot Training Programme is launched to provide historically disadvantaged individuals with the opportunity to become SAA pilots. 29 Nov 2008 : An SAA strike by its call centre staff (Voyager & flight reservations) starts with pickets near O.R. Tambo International Airport. It ends the following evening, after SAA agree not to outsource its Voyager call centre to Dimension Data. 15 January 2015 : South African Airways (SAA) became only the second airline in the world to achieve IATA’s Stage 2 status of the IATA Environmental Assessment Program (IEnvA). SAA is one of only two global airline to achieve stage two of IEnvA’s program. IEnavA is an airline environmental management and assessment process that measures the carbon footprint of global airlines. The IATA program aims to set sustainability standards for airlines around the world which will cover all areas of operation. The program will improve standards of air quality and emissions, fuel consumption, aircraft noise, recycling, sustainable procurement, energy efficiency, biofuels and loads more. SAA passed its Stage 2 assessment in record time. The assessment was finalizing six months prior to the 2 year deadline. 1 August 2014 : SAA has been awarded the Best Airline in Africa 2014 at the Skytrax Awards for the twelfth consecutive year. This is based on a customer satisfaction survey. 16 April 2014 : In 22 travel predictions for 2014, it's predicted that South African Airways will win an award for Best Airline in Africa. 19 December 2013 : Best Airline in Africa : Premier Traveler Magazine, Business Traveler Magazine & Global Traveler Magazine have all name SAA as the best airline in Africa for the 10th year in a row. "The readers of these three prestigious magazines are truly discriminating and difficult to impress, given their extensive travel to all corners of the globe. It is certainly a feather in our cap to be named their favorite airline to the African continent, and to even earn a spot in Global Traveler's Hall of Fame. We will work hard to continue to earn their loyalty and praise by offering the most convenient schedules and the most comfortable amenities from North America to the African continent." said Marc Cavaliere, SAA's executive VP in North America. 17 October 2013 : SAA wins Africa's Leading Airline at the World Travel Awards. 26 August 2013 : SAA wins the following Business Travel Africa Awards : Best African Long-Haul Airline, best African short-haul airline, best business class and best business class lounge. May 2013 : A German magazine, FVW, votes South African Airways' business class as being the best in the Star Alliance group. 26 April 2013 : Business Insider Magazine votes South African Airways the 11th best airline in the world. 18 February 2013 : SAA wins the award for the most on-time airline in the Middle East and Africa, from FlightStats. February 2013 : Skytrax awards SAA a 4-star rating for 2013. "South African Airways has managed to maintain quality levels throughout the past year, and are delivering a solid product and service standard to their customers, making their 4–Star ranking well–deserved." said the Chief Executive of Skytrax, Edward Plaisted. 14 September 2012 : SAA wins the award for "Best Airline" at the SATOA Travel Awards: " “It is a privilege for South African Airways to win this award. Our mission is to offer our customers the smoothest of travel experiences to Southern Africa and beyond,” said Gary Kershaw, UK & Ireland Country Manager for SAA. “Our world-class product offering combined with warm hospitality ensures that our customers’ African experience starts from the moment they step on board. Thank you to everyone who voted for us." 5 June 2008 : SAA wins the OAG Airline of the Year Award for the "Best Airline Based in Africa".